New platforms emerging and growing strongly, more established players struggling – 2015 proved to be an exciting year for the industry in continental Europe! Eric Schmidt, executive chairman of Google’s parent company Alphabet, spoke recently about the European ambition to push ‘a European digital single market’. The UK has always been ahead of Continental Europe in the P2P and marketplace lending space – the industry started in the UK and volumes to date have been bigger. Funding Circle’s acquisition of German marketplace lending platform Zencap points to a recognition that Europe has large growth potential and could mark the initial moves in the industry to a European single market. Continental European platforms ended 2015 with a mixed array of monthly origination results. The Liberum AltFi Volume Index (Continental Europe) suffered a 32.9% decline in monthly volume relative to November, and in large contributed by a significant 77% plummet in volume for Auxmoney. Several platforms, however, propelled origination volumes and established record months. These include Twino, Loanbook and Lendahand whilst Finexkap was came within a whisker of achieving a new invoice financing record. The Continental Europe volume index concluded 2015 with € 674m lent over the course of the year, giving €1.34bn in cumulative financing. This represents a robust 102% year on year growth, topping the UK’s 82% yoy growth. The UK, as can be seen from the bubble chart above, nevertheless, marches on well ahead with a sizeable disparity between the two markets. Several platforms have experienced substantial year on year growth in 2015 including index heavyweight Auxmoney which reported annual 2015 growth of 320%. The German consumer focussed lending platform also secured the largest record month of any in the index reporting €36.5m in September 2015. Whilst the biggest month overall for P2P lenders was established earlier in the year in June, with €77m posted. At the other end of the spectrum some platforms transacted lower loan volumes in 2015 relative to 2014 and, whilst slightly disconcerting, this highlights the infancy of Continental Europe’s marketplace lending activity as technology and other operations are gradually scaled and refined. 2015 also saw the demise of one European platform – TrustBuddy – in spectacular fashion. 2015 growth in business lending outstripped the growth seen in the consumer lending sector which continued to dominate in terms of absolute volume index throughout 2015. The year also saw the emergence of innovative entrant Finexkap, a platform offering working capital solutions to SMEs in France which has one of the largest factoring markets in the world. The platform secured 2% of 2015 P2P financing according to the index and is poised to become a significant contributor to the invoice financing sector of the index going forward. 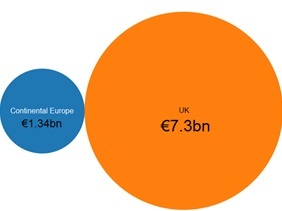 Whilst estimates of the total addressable market put Continental Europe at 5.2 times that of the UK, lending volumes for now have lagged behind those of UK platforms. This may not, however, necessarily be the case in three to four years time. The role of the regulator across Continental European territories will be crucial to allow marketplace lending platforms to innovate, develop new product offerings and move towards cross border activity. A united digital single market for Europe is powerful on both a financial and social level, a union which in recent times the media may have us believe to be a fragmented block of nations.